Before we get into this topic, it is important to note how I am defining petrophysics. 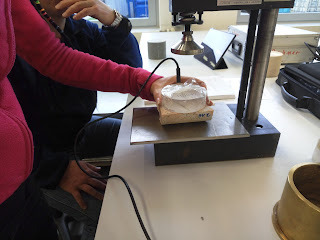 For a full explanation see my previous blog, but in a nutshell I use petrophysics as “a term to express and explain the physical responses of particular rocks and sediment types”. Straight off the bat it should be obvious that petrophysics and the associated insights it brings are applicable to a wide variety of geoscience challenges, particularly in the understanding of the subsurface. I would like to offer a few examples below but I should also mention that this article is not exhaustive. These are just a few example applications of data, primarily from the International Ocean Discovery Program (IODP) and its precursor programs, where downhole (well) log data is routinely collected and has been used to answer the scientific challenges of its science plan. Many of the strengths and applications of petrophysical data derive from the nature of its acquisition. Well log data provide an ‘investigation area’ that is relatively unique in the fields of geoscience investigation techniques. Sediment, rock and core samples and their analysis are commonplace, and investigate the nano-to-centimetre scale. Whilst seismic profiling provides basin-scale architecture, at its very best the data have a resolution of 10 metres. Log data covers the 0.1-100 metre scale area of investigation and is one of the few technologies specifically designed to do so. Added to the fact that logs capture continuous data and the in situ properties and, for these reasons, I think logging data should be more commonly utilised and considered when generating, and ground-truthing, geological models. Geoscientists can benefit greatly from integrating petrophysical data with their other data generated from direct sampling or observation of sediments or rocks. Petrophysics is geared towards answering why certain rock types exhibit the physical responses that they do, and in doing so producing quantifiable information on chemistry, mineralogy and fluid content (where possible). Invaluable information for sedimentology and petrology. The continuous downhole (or more accurately, up-hole) recording of data also makes it ideal for capturing and analysing stratigraphy, cyclicity and other trends. This again can be valuable information for all geoscience disciplines but really add value to geoscientists researching palaeoclimates, paleoenvironments and paleoceanography, including those interested in sediment source. Logging tools have different purposes with some aiming to characterise different aspects of the formation than others. Many tools such as electrical resistivity have deep areas of investigation (typically 1.5-2 metres). These tools can provide information on formation structure and fluid content rather than mineralogy and chemistry. Other tools can have extremely shallow depths of investigation such as the various imaging tools (millimetres). 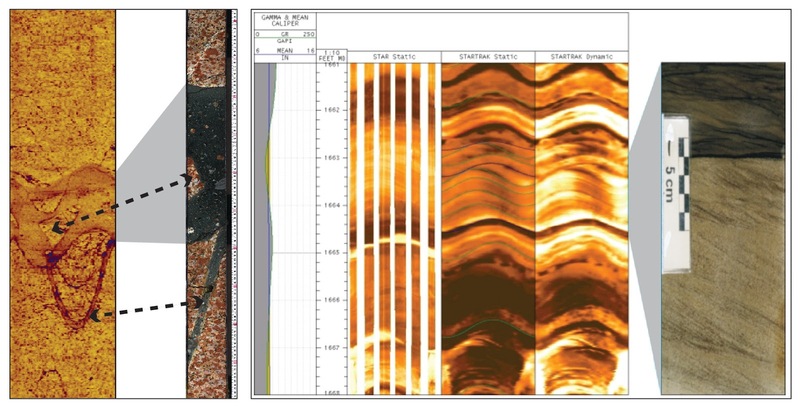 Borehole images can be used to analyse millimetre-scale textures and sedimentary structures within rocks and sediments as well as to examine fault orientation, dip and dip direction. Imaging tools are deployed as standard during IODP expeditions and are becoming increasingly common elsewhere. The examples of borehole images below cover most of the spectrum. The left image was recorded during IODP Expedition 364 using a slimline acoustic imager . The image has clearly recorded the coarse grained nature of the granite, but has also captured two generations of intrusion and measurable fractures comparable with the corresponding core from this depth. In the right image, wireline electrical resistivity images and Logging While Drilling (LWD) images have captured cross bedding in deltaic sandstones 1600 feet (~490 metres) below the surface in an oil well in Oklahoma . The discipline of petrophysics is closely related to geophysics and integration of petrophysical measurements with other types of geophysics data can be of great benefit. It could be argued that the most useful data are those generated by the sonic tool. The sonic log is a continuous, usually high-resolution record of compressional velocity along the well path . These data can ground-truth seismic surveys in the area by establishing the time-depth relationship and, importantly, linking well log to seismic profile and ultimately core to seismic. Morgan et al. demonstrate this in their scientific expedition drilling in the Chixculub impact crater peak-ring. Here the seismic P-wave velocity (km/s) obtained from sonic wireline logging data confirmed that the predominantly coarse-grained, granitic rocks of the peak ring were indeed characterised by the low densities and low seismic velocities suggested by geophysical models based on seismic refraction data. When the sonic log is combined with a density log it also becomes possible to calculate acoustic impedance (a property of rock layers and their boundaries that govern acoustic reflection coefficients). Combining these petrophysical log data allows for creation of a synthetic seismogram. Further insights can be made into seismic profiles if shear slowness logs are generated as these can advise on formation fluids. Access to fresh water is already one of society’s greatest challenges and will be an increasing concern in to our future. Lofi et al. used a range of data from IODP Expedition 313 including lithology, 2-D seismic profiles, pore-water salinity measurements, porosity measurements, density measured from core, thorium content (from downhole spectral gamma-ray logs) and sonic velocities from downhole logs to determine the geological heterogeneities affecting groundwater exchanges on the New Jersey shelf. 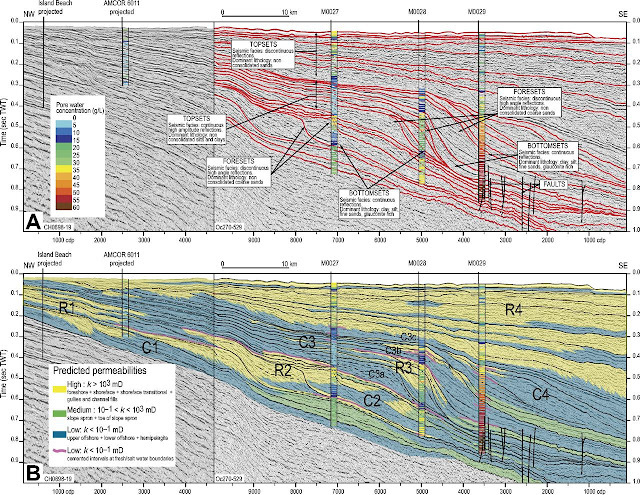 Their work revealed evidence for a multi-layered reservoir/aquifer where waters with very low salinities (<3 g/L) were encountered at depths below sea floor exceeding 400 m and fresh and/or brackish-water intervals alternate vertically with salty water intervals on this passive margin. It is also worth mentioning borehole gravity surveys, and here I must admit that I am a bit out of my area of expertise. Suffice to say though they are to gravity surveys what sonic logs are to seismic surveys . For more information on borehole gravity surveys and their relationship to surface gravity surveys see Martin Kennedy’s book Practical Petrophysics – Chapter 14: Geophysical Applications. Downhole tools are becoming increasingly versatile with tools for magnetic susceptibility, fluid sampling, magnetisation and borehole imaging. Core-based petrophysics is also a rapidly expanding field with increasing commonality of chemical analysis such as XRF, hyperspectral imaging and near-infrared spectroscopy. Understanding of the data produced by these new tools is of increasing importance to academia and industry. For ‘of reservoirs’ read any sedimentary basin, aquifer, impact crater, passive margin, mid-ocean ridge, obducted ophiolite, subduction zone, slow-slip zone – the opportunities are limitless. So if this has given you pause for thought and you are interested in knowing more, why not have a look into how petrophysics can benefit your science? Lofi, et al. 2017. Scientific Drilling, 24, pp.1-13. Ritter, et al.2004. SPWLA 45th Annual LoggingSymposium. Society ofPetrophysicists and Well-Log Analysts. Morgan, et al. 2016. Science 354 (6314),878-882. Kennedy, 2015. Practicalpetrophysics (Vol. 62). Elsevier. This is, in my view, a good definition. But I wanted to take it a step further by exploring a little history. Petrophysics is a term generally linked to downhole (well) log measurements and their analysis (by petrophysicists) to evaluate rock properties. 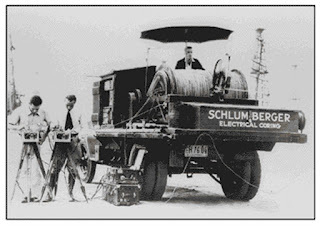 The Schlumberger brothers ran the first well log (or something close to it) in 1927 when they lowered an electric sonde down a well in Pechelbronn, Alsace, France to measure electrical resistivity. This was the first “down hole” measurement of rock properties using technology that Conrad Schlumberger had been developing since 1911. For a great history of the first well log and the road travelled by the Schlumberger brothers to start the international company we know today, see the Schlumberger website (definitely worth it for the pictures alone). So began the relationship between the rise of petrophysical analysis techniques and the growth of the oil and gas industry. Technological developments and new techniques have since stemmed from the needs of the industry and petrophysics remains a tool most commonly used for describing and analysing all aspects of the hydrocarbon system. In turn, this created a bias in the available technologies, with the majority of tools (at least originally) being designed for describing porous media and the quantities and nature of the fluids they contain. However. I would argue that, despite this ‘tool development’ the Schlumberger brothers are not the fathers of petrophysics. I would argue that this title belongs to Gus Archie, the author of two of the top 10 landmark papers in petrophysics and formation evaluation - including the famous Archie equation for determining water saturation . The Schlumberger brothers were the first to develop and implement the technology, but it was Archie who was the first to understand the data. In his book “Practical Petrophysics”, Martin Kennedy discusses the history of the technique, stating that before Archie, petrophysical data were primarily used for qualitative interpretation of the sub-surface, such as identifying sands and sometimes distinguishing water and oil in pore space . 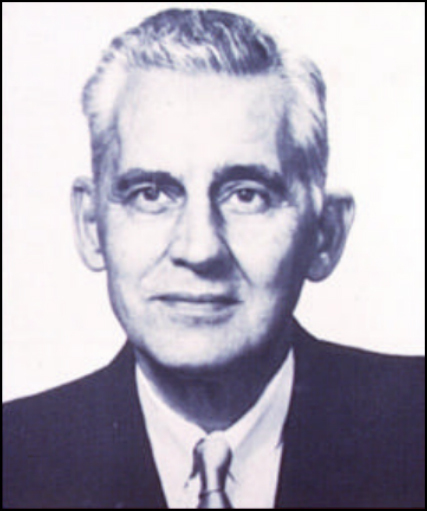 It was Archie who, in 1938, was charged by Shell's Texas-Gulf area production manager, D. B. Collins, with the task of understanding electrical logs . And it was through this venture that Archie’s now-famous equation appeared in 1942 followed by the Archie’s first published use of the term “petrophysics” shortly thereafter in 1950 . In his 1950 paper Introduction to Petrophysics of Reservoir Rocks, Archie describes petrophysics as: “A term to express the physics of rocks. The term should be related to petrology as much as geophysics is related to geology. ‘Petrophysics’ is suggested as the term pertaining to the physics of particular rock types” . It’s worth noting that this term may have been already used informally at the time, but as the first published example, I believe Archie should be credited with the definition. It is within this ‘why‘ that I think academic petrophysics can thrive. Petrophysics has its roots in understanding why rocks exhibit the physics that they do, and this is not limited to sands and mudstones (shales). While the majority of downhole tools are still biased toward characterising reservoir (sandstones) and cap rocks (mudstones) for hydrocarbon prospecting there are so many other useful tools, data and applications out there where petrophysical analysis can make a major contribution (more on that in the next blog). All of the statements above are my own opinion. Archie, G. E., 1942. The electricalresistivity log as an aid in determining some reservoir characteristics, Trans.AIME, 146, 54–67. Kennedy, M.,2015. Practical petrophysics (Vol. 62). Elsevier. Thomas, E.C.,1992. 50th Anniversary of the Archie Equation: Archie Left More Than Just anEquation. Log Analyst May–June, 199-205. Archie, G.E.,1950. Introduction to petrophysics of reservoir rocks. AAPG bulletin, 34(5),pp.943-961. Corinth Active Rift Development: end of offshore....time for Bremen! View 8: offshore phase is complete so let's get ready for the onshore phase! The Pre-Pre-OSP took place at MARUM in Bremen 4-7 December 2017. Our team (Sally, Malgorzata, and Nataliya) set-up and tested Thermal Conductivity (TC) equipment. The training on the half-space line source (HQL) and the full space line source (VLQ or needle probe), including 2-phase measurement practice, was given by Lothar (a very professional and creative technician from Aachen University). We went through both methods but only a VLQ needle probe will be used for IODP Expedition 381 (Corinth Active Rift Development). We took time to familiarise with operating procedures and even become Drilling Masters! TC equipment is now secured in the reefer at MARUM for Christmas holidays waiting for Pre-OSP in January. The training was very instructive with a lot of notes taken during this week. Thanks for Malgorzata to complete existing TC operating procedures and to create a new very useful TC manual! 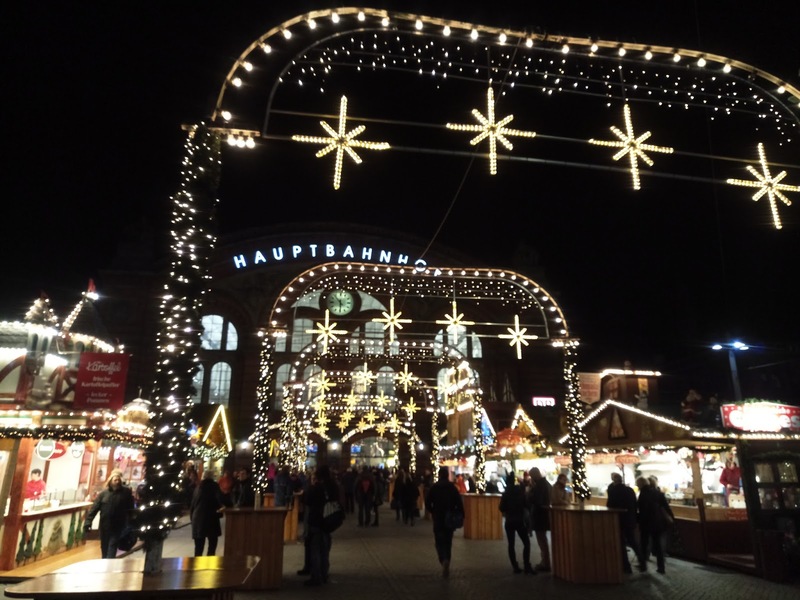 And Bremer Weinnachtsmarkt (Bremen Christmas Market) with over 170 decorated stalls was an ideal place for relaxing in the evenings. 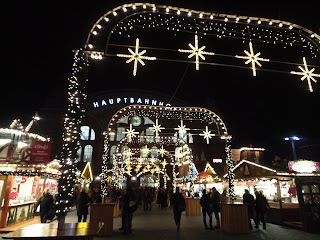 A lot of food and drink to taste: different kind of sausages (Krakauer, Bratwurst, Rostbratwurst, Bregenwurst…) as well as Beer and Glühwein (mulled wine, with rum for braves). So this is like the blog title suggests………..a very brief update! The offshore team have now completed the second site. While some of us in EPC are expecting a snowy weekend to come, the offshore contingent are looking forward to a (probably!) quieter weekend than the previous one. Last weekend, the second downhole logging was in full swing, and there were some challenges to keep it interesting. This is where the Petrophysics Staff Scientist is simultaneously a very demanding but very satisfying role, as it is essential to keep abreast of all developments and be able to rapidly communicate these to all key players offshore, make accurate decisions and coordinate the way forward to successfully acquiring data downhole. We look forward to a future blog post summarising the logging but in the meantime, note the concentration on the faces of the logging team! The MSCL has been uneventful. That is good, as this means data acquisition of petrophysical properties on whole round cores is progressing well. And again, there was time to measure cores for QAQC during the downhole logging. 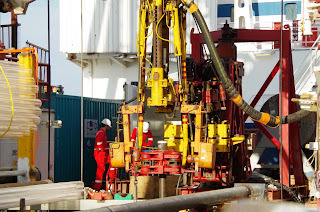 In other petrophysical expedition news, Sally, Malgorzata and Nataliya (the latter being temporary IODP employees to help with measurements onshore) were recently in Bremen to set up the first equipment ready for the cores arriving back from the ship in January. Again, watch this space for more details soon! Seems like an obvious place to start. When I’m at home getting out of bed and on my way to work is a simple half-an-hour task. Quick shower, quick bit of brekkie and that’s that. It’s a bit harder after you work 12 hours a day for 5 weeks. 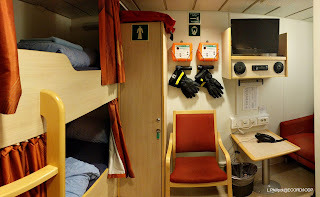 And have I mentioned the beds on the Fugro Synergy? It might just be the hours talking (although I don’t think so) but the beds here are super comfortable. The other factor is coffee-management. It’s easy to drink coffee because it helps so much with the long shifts. You've got to be careful you don’t disturb that sleep cycle though. When I first joined the vessel I was drinking one a day but this ramped up to 5 cups of coffee a day by week 4 on board. Since then I have kicked the habit and am now caffeine free. It’s the little things. 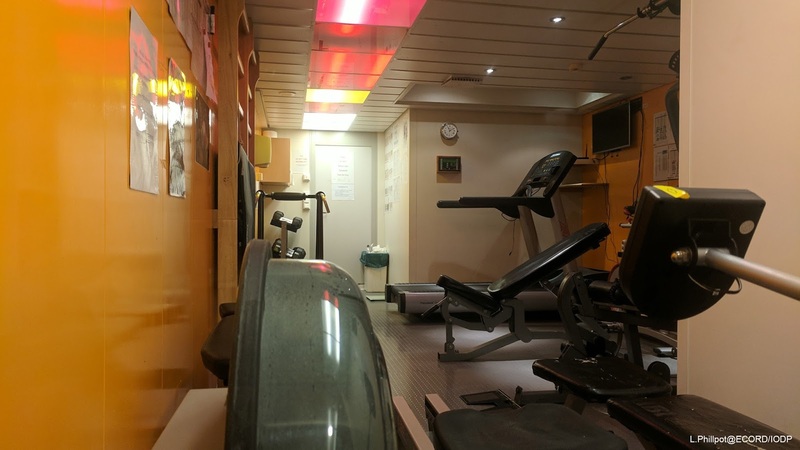 Meals are served for an hour and a half every 6 hours on the Synergy. And they are good. At least 4 options of hot mains provided every time and plenty of sides to accompany them. I have managed to limit myself to only 2 three course meals per day thus far but it has been a challenge. The food has changed throughout the cruise. Bananas and most of the other fresh fruit disappeared along with the most popular cereals and condiments. Somehow Nutella has lasted this long despite it being a very popular choice. Through what I can only assume is some sort of black magic fresh salad appeared a couple of weeks into the expedition at the same time as all of the apples were painted in wax; giving them a plastic and cartoonish appearance. However, after a quick wash they’re still fresh and crunchy on the inside. Fresh veg was replenished on board at the port call after the first site but we just repeated the cycle again with its disappearance. Very surreal. After this it’s time to don PPE and start my morning commute. The MSCL is built into a 20 foot container, so there’s no chance I’m doing star jumps between cores. It’s okay though the Synergy has a gym. 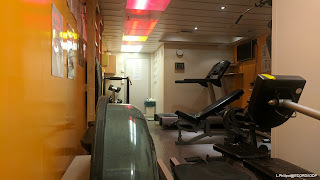 It’s a simple gym with basic equipment (running machine, exercise bike, rowing machine, dumbbell set and a couple of those reclining chair/bench things). It’s more than enough for an end-of-the-day stretch. I have also started a 100-a-day press-up challenge with a few friends from home, and that is something that I can do between loading cores onto the MSCL! I’ve kept it up for three weeks so far and I can see the light at the end of the tunnel. 4. Sitting at the MSCL. This is where I spend the majority of my day. It’s a fine enough place to do it. Abah (my opposite shift partner) and I are the only scientists who have a whole container to ourselves (hence the press-ups), which has its positives and negatives. It’s alright though; we have a coffee machine so that is bringing in a lot of visitors nowadays. Operating the MSCL as efficiently as possible to keep up with the recovery rate is best achieved by channelling your inner robot. Be an extension of the machine (Neo?). There are many steps that need to be taken in order to make sure that all data is recorded in a meaningful way and at that nothing is missed. 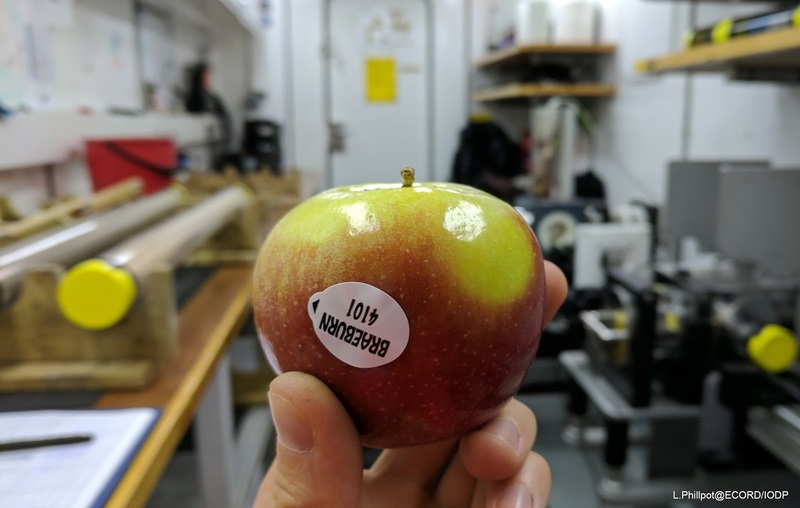 This includes (but is not limited to) recording data at the correct time after the core has arrived on deck; QC-ing the curation process with the assistance of the MSCL’s built-in precision ball-screw core pusher and associated laser; and measuring temperature at all stages. The recovery rate thus far on Expedition 381 has been steady and we in the MSCL lab have mostly been able to keep up. That said, there’s a white-board pinned to one of the walls of the MSCL container and it has had become an extension of my brain. Most heavily used during the second half of the shift it’s especially helpful for staving off the post-lunch “I ate too much again” food-coma. The most interesting thing I have learnt about operating the MSCL all day is how quickly my body adapts. The MSCL motor makes a whirring sound every time it moves and it moves all the time, never pausing for more than 30 seconds. In the first week I developed a 6th sense whereby I subconsciously count in 30 second periods. I don’t know, maybe it came from watching the MSCL for so long, but now if I go for more than 30 seconds without hearing that sound I subconsciously know something requires my attention. It’s really rather cool. The 5th and final task where time is allocated in any day is time allocated to scratching my head. There are a lot of questions raised when you are on the front-lines of scientific discovery, so I spend a more significant portion of my day than usual in quiet contemplation as I troubleshoot unexpected values and strange data points. Despite the MSCL producing a tremendous amount of high-resolution data very quickly we still have a task on our hands processing it to output a high quality (and usable!) dataset. That’s not to say that we have discovered everything there is to see so far already, far from it. After all, we are only one cog in the engine and this is only the first half of the expedition. We will need to wait to see the rest of the puzzle pieces when we split the cores at the Onshore Science Party in a couple of months. And that’s pretty much what I do daily while I am here. Rinse and repeat. Corinth Active Rift Development: first hole complete! View 5: what does everyone else do during logging? So the first logging operations were completed over the weekend………….but I am only blogging about this now because unlike those offshore I don’t have to work all weekend! However, all of the team onshore are always on call to answer any queries that the offshore team have and are very good at sending virtual chocolate supplies. Downhole logging takes place once coring has finished in a borehole (ok this can be a simplification but applies to the first hole in Corinth Active Rift Development: Expedition 381). And logging can take several days, with different toolstrings and different stages, especially when borehole conditions throw up challenges, such as was the case for this borehole. For anyone impatient, here is a photo from early on in the logging operations. As this is a petrophysics blog, you will have to check out the Expedition blog to find out what other participants do, but here I can discuss how EPC’s Laurence and Abah from the Science Party spent their time. Did they put their feet up and relax? No, certainly not, the gap in core arriving on the ship is often time for the hard-working MSCL operators to catch up on any backlog that has accumulated. Here, as Laurence and Abah had that under control they had plenty of time to run quality assurance and quality control (QAQC) cores through the MSCL to provide checks on the data being acquired and ensure that all sensors are operating to their optimum efficiency. This process is achieved both by using specially selected cores to act as QAQC cores, but also by using the calibration pieces that are prepared in the liners used for each specific expedition. In summary the Petrophysics team have had a busy few days! What is really enjoyable once the team have both core petrophysical and logging data is tying this together, analysing correlations and identifying where gaps or questions in one dataset can be answered by studying another, and of course starting talks with other scientists about the data that continue into the onshore phase (in Bremen in February 2018) and beyond. 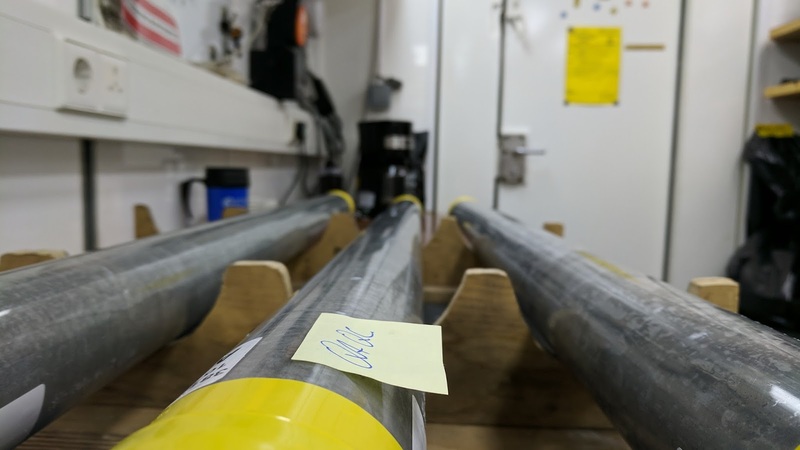 The petrophysical measurements that are taken offshore include both petrophysical measurements on the recovered core and measurements taken in situ in the borehole by downhole tools. 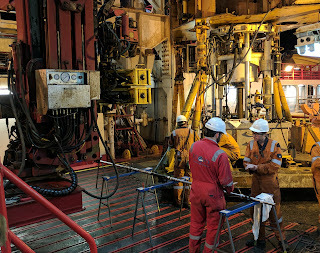 The core measurements on the first hole of the expedition are well underway and we are excited that the first logging is due to take place fairly soon. The next blog post will contain news from offshore on this! 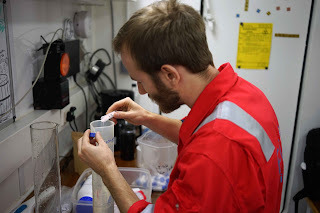 The last blog post introduced the Geotek™ Multi-Sensor Core Logger (MSCL), which is a piece of equipment that EPC staff and those scientist who operate it offshore become very familiar with, and on Corinth Active Rift Development: IODP Expedition 381, EPC’s Laurence and Abah from the science party are working in opposite 12 hour shifts. 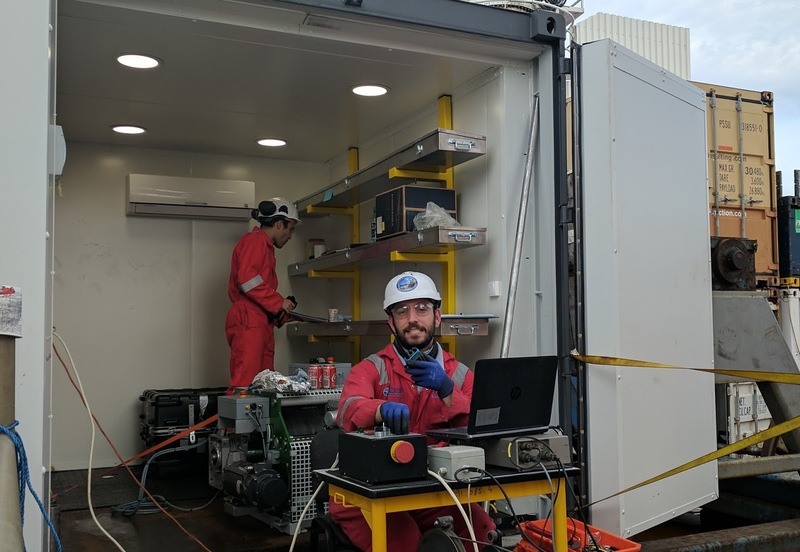 The MSCL has sensors measuring magnetic susceptibility, electrical resistivity, P-wave velocity, gamma density, and natural gamma radiation, each of which have their own special ways in which they contribute to the expedition aims. Offshore these measurements are also helpful in providing the petrophysics team with some prior understanding of the borehole before downhole logging commences. 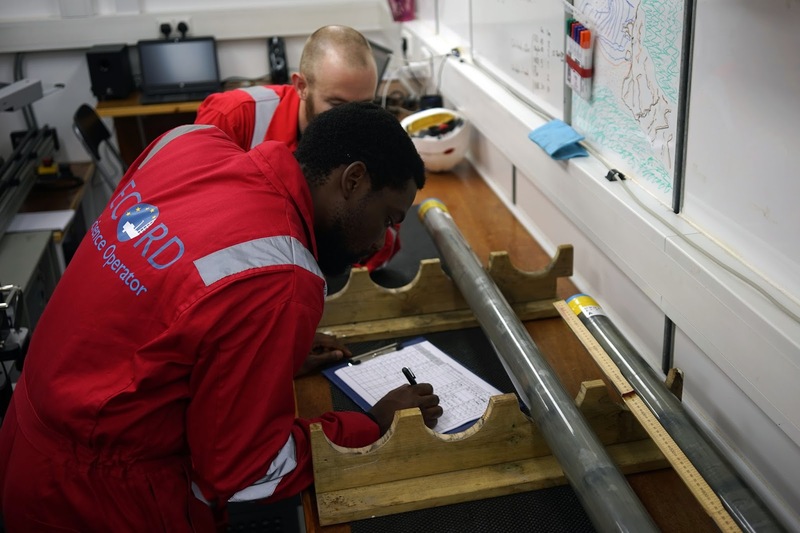 The downhole logging measurements plan and operation is coordinated by the Expedition Petrophysics Staff Scientist, Erwan, requiring detailed discussions offshore with the operational team, the Expedition Co-chief Scientists and the logging engineers. In a perfect formation, in a perfect hole, logging is straightforward and each tool can be run in open hole down to the bottom and measure all parts of the borehole. That can and does happen! By this phase of the operation, analysis of the MSCL measurements and observation of the lithologies recovered can help to inform the logging program in this first hole. Where parts of the hole are anticipated to be less than perfect (which also can and does happen! ), the logging team consider options such as logging the hole in more than one phase. 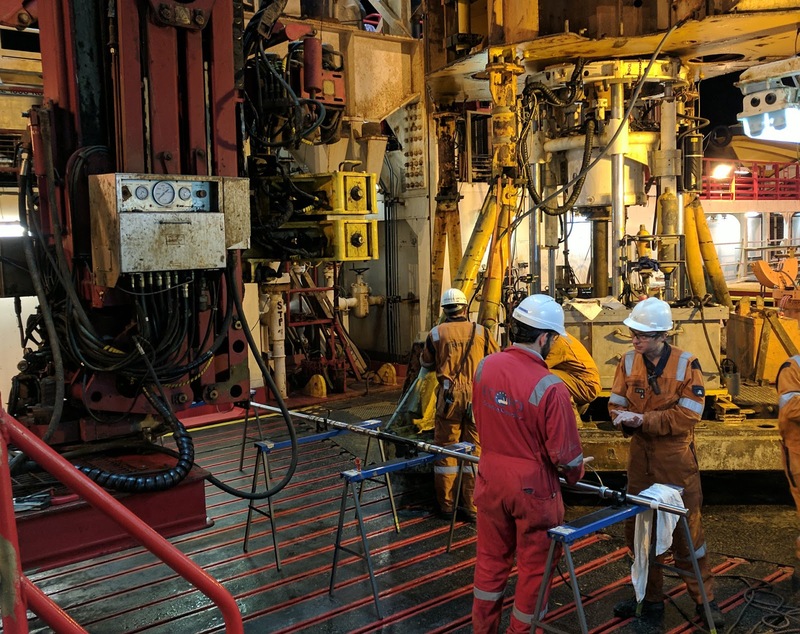 Again, watch for the next blog post to find out more about the first downhole logging from Corinth Active Rift Development: IODP Expedition 381 …………. or if you can’t wait for that, check out the recent articles on the Expedition 381 blog!